What should be taken into account for developing a Maritime Spatial Plan of a cross-border area? What are the methodological steps for development of a Maritime Spatial Plan of a cross-border area? What are the main elements of a Maritime Spatial Plan for a cross-border area? The objectives of the MARSPLAN–BS project are: (i) to support the implementation of the EU Directive on Maritime Spatial Planning; (ii) to establish an institutional framework for Romania-Bulgaria cross-border Maritime Spatial Planning; (iii) to consolidate the cross-border cooperation and exchange of information between Romania and Bulgaria on issues related to maritime area; (iv) to create a vision and strategic objectives for the Black Sea area, also taking into account the interaction between the territory and the sea; (v) to elaborate a Maritime Spatial Plan for the identified Romania-Bulgaria cross-border area (Mangalia - Shabla); (vi) to disseminate information about Maritime Spatial Planning for the Black Sea and good practices to all relevant actors; (vii) to elaborate and implement MSP Methodology in the Black Sea region. The Maritime Spatial Plan for the cross-border area Mangalia-Shabla focuses on the main development regulations for the maritime spatial surface, taking also into account coastal pressures, focusing on social, environmental and all relevant economic domains, in order to prove the efficiency of the MSP methodological and institutional framework. The Maritime Spatial Plan aims to coordinate the efforts of relevant stakeholders in order to create a common vision for development of the region. The Maritime Spatial Plan for Mangalia-Shabla was conceived as a pilot project within the MARSPLAN-BS project’s objective of a MSP Methodology, in order to test the capacities of Bulgaria and Romania to develop and to adopt an instrument for management of marine areas. The Plan takes into consideration the existing data, describes the processes of the natural marine areas as well as the human activities performed between Mangalia and Shabla, in order to strike a balance between human activities and ecosystems. The Plan is meant also to put into practice the EU Directive for MSP, thus creating an institutional framework for MSP implementation at national level in Romania and Bulgaria, and enhancing the cross-border cooperation and exchange of information between the two countries. The development of the Maritime Spatial Plan for the cross-border area is performed through five steps. These are described in five deliverables, consolidated after stakeholders meetings in Mangalia and Shabla with local authorities and communities’ representatives, using the methods of consultancy, SWOT Analyses and Sketch Match. First, the research team analysed the current situation, including relevant for the area documents – international conventions, memoranda, protocols, action plans, as well as programmes and projects. Spatial planning and strategic documents pertaining to the two regions were also reviewed. Thereafter, marine processes and activities in the area were studied. The latter included condition of the natural environment, influences and pressures on marine environment, and marine economic activities and uses. A significant part of the work was devoted to analysis of the technical infrastructure and networks such as infrastructure for water management, ports, terrestrial transport, airports, energy production and energy distribution networks, telecommunication networks and infrastructure, oil and natural gas reserves and distribution, etc. 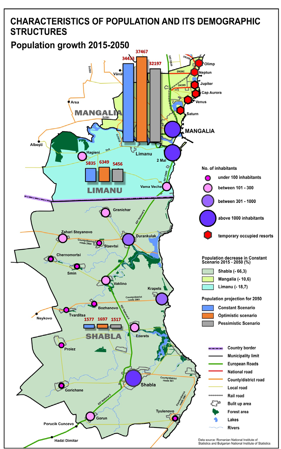 After that, there is an overview of the socio-demographic situation in Mangalia and in Shabla, including analysis of economic activities performed near the coast (e.g. exploitation of natural resources), type of soils in the region, water resources (e.g. rivers and lakes), agricultural activities and their impact on the environment, influence of the Exclusive Economic Zones on the studied region, etc. At the end, the authors (coordinated by the National Institute for Research and Development URBAN – INCERC, Bucharest) provide the results of a survey among stakeholders, where conflicting activities and uses are identified and discussed. The second Report (deliverable) compiled, in a concise and consistent manner, the main issues which arose from the situation analysis. 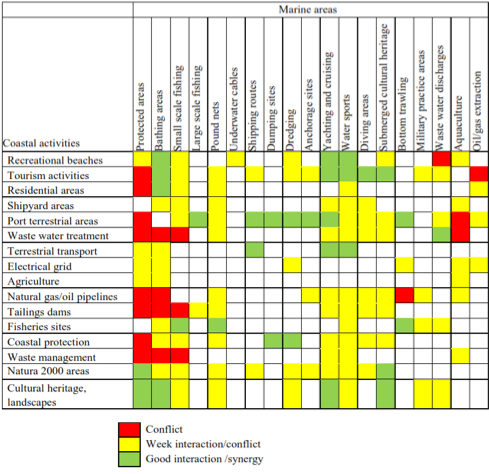 It focused on those matters that are related to maritime uses and spatial development that can be addressed by the Maritime Spatial Plan.This part of the matrix analysis presents the compatible maritime uses and the land-sea interactions (see Fig. 2 and Fig. 3 below). 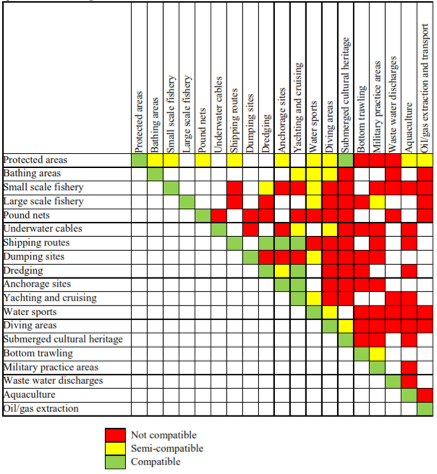 Furthermore, a SWOT analysis of each use and activity is made, as well as an assessment of the natural and anthropogenic risks in the study area. The latter are grouped into economic relevance and are analysed for each natural protected area in terms of their magnitude (low, medium, and high) and effect (positive or negative). The third Report presents analysis of (probable) future situations. The study provides forecasts for the activities and uses of marine and coastal cross-border areas for the next twenty years (up until 2050). The forecasts are broken down by type of activity at an aggregated level. The research team has calculated (on the basis of historical data and trends) dynamic of population in the area (see Fig. 4), economic activities, and urban and infrastructure development. The Fourth Report (deliverable) elaborates an overall diagnosis through developing of four alternative strategic growth scenarios for the Maritime Spatial Plan (see Fig. 5 below). Thereafter, on the basis of a SWOT analysis of these scenarios, a preferred option is identified, which serves as a strategic direction for the Plan. 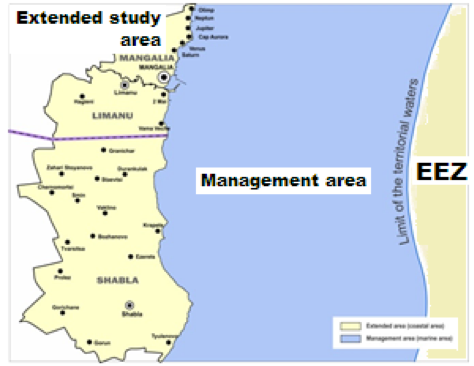 The developed scenarios relate to the levels of economic growth that Mangalia - Shabla marine area may need to accommodate over the implementation period (2025 – 2030). The last deliverable is the Strategy of the marine cross-border area, i.e. its Maritime Spatial Plan. It presents the economic activities for the areas and measures for protection of the ecosystem, which spans for over a 10 years period, up to 2025-2030. The Plan deals with all maritime natural, economic and physical aspects. It provides the spatial vision for the cross-border region, principles and goals (environmental, economic and demographic), activities (direction of action), strategic objectives, and an action plan. The Plan presents the zoning of the marine areas, e.g. zones for economic activities and uses, and their compatibility or non-compatibility with other activities and uses. 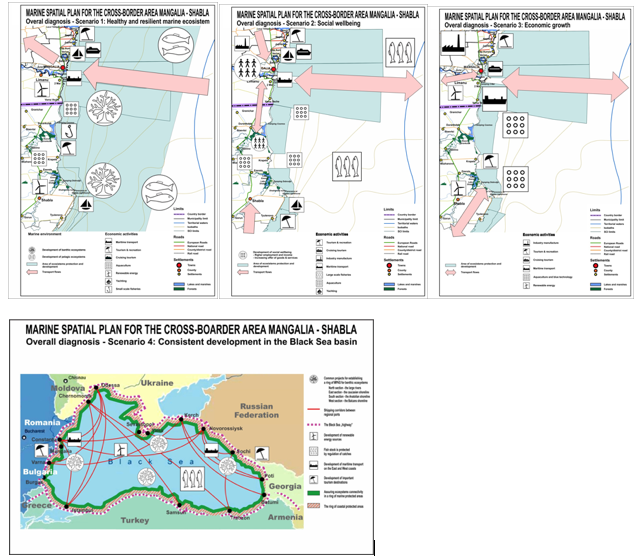 Marine spatial plan for the cross-border area Mangalia-Shabla: Volume 1. Current situation analysis - topic paper. The Maritime Spatial Plan for the Cross-Border Area Mangalia - Shabla is a result (a pilot study) that includes the experience and knowledge accumulated during the implementation period of MARSPLAN-BS project. It is not a document implementing the MSP Directive (Directive 2014/89/EU) in Romania and Bulgaria, and is not subject to approval by national/regional/local authorities of both countries. The practice is fully applicable in other contexts, as it provides a framework and methodology for development of a Maritime Spatial Plan. The practice could be transferred in other cross-border areas by following the steps outlined in the reports describing the preparatory work preceding drafting the Maritime Spatial Plan for Mangalia-Shabla.